It’s hard to not take it personally when your students break rules. Four students are late to class and you wonder why they don’t take calculus seriously. Jeremy continues to fake read during independent time and you conclude that he doesn’t respect you. We assume that rule-breaking behavior is caused by a lack of respect or defiance, or worse — it’s a character flaw. But we couldn’t be more wrong. Everyone in the world breaks rules, and we break them all the time. Think about that speeding ticket you not only received as a result of breaking a rule, but also may or may not have paid on time. What about those glances you snuck at your cell phone during grad school class? And these are just rules that someone imposed on you. What about the rules you create for yourself? For example, on Sunday you might grandly declare that you will no longer consume carbs Monday through Friday, then on Thursday you are eating a plate of nachos and polishing off a second margarita, living your best life. There are lots of reasons to break rules, and most of those reasons are not due to a lack of respect for the person who created them. We break rules because we lack self-control, or because we think we won’t get caught, or that the repercussions are minor, or we are rushing, or exhausted... We break rules because we are human. The point is — it’s not personal. Remember this when Mekhi puts his feet on the chair that someone is about to sit on, or Ashley starts chatting during work time for the seventy-fifth time. Assume the best, assess the situation to determine what is motivating them, and, by all means, address the rule-breaking behavior with follow through until the issue is resolved. But do it with grace and empathy, and use the least invasive method possible. Once we have a better understanding of why students break rules, we can adopt a more productive response. Remember, our goal is to improve student behavior. Public shaming is never a component of this equation, and often punishment isn’t even necessary. 1) We build the relationship with the student(s) in question by assuming the best, giving students an opportunity to save face, and showing forgiveness when they make mistakes. A strong relationship encourages student compliance, which leads to positive student outcomes. 2) We bolster our own authority because less-invasive strategies don’t draw attention to the fact that students aren’t complying. Instead, we describe a classroom that is orderly and structured. Maybe it’s teacher trickery, but it works. Here’s what I mean: Imagine two classes with the same problem. Students don’t get started on work right away. You gave them directions that are written on the board. They have nine minutes to finish but some students have barely started. Which class do you want to be in? Which teacher do you want to comply with? From my experience, students are actually more likely to comply with Teacher 2, but let’s say for argument’s sake that both have an equal chance of producing compliance. The students in Teacher 1’s class are now complying but have negative feelings towards the teacher and likely themselves. The students in Teacher 2’s class are not only complying but they have positive (or, at worse, neutral) feelings about their teacher and themselves. It’s easy to see which strategy is the better choice. Approach 1 focuses on the past, which can’t be changed. Approach 2 focuses on the future, which can. 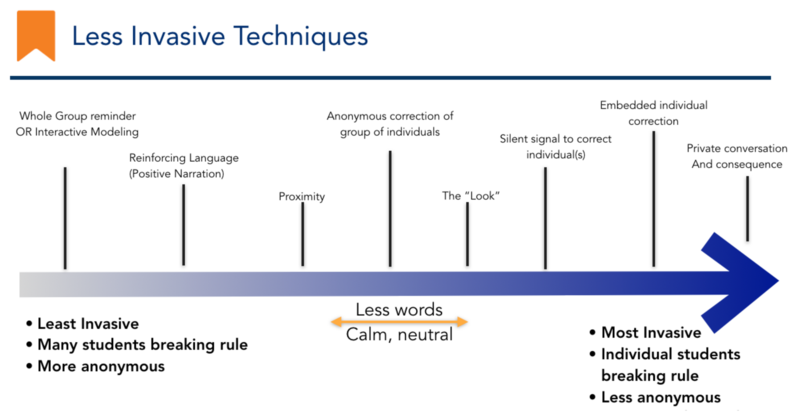 Approach 1 draws attention to negative behavior, which diminishes authority and promotes negative thinking. Approach 2 draws attention to positive behavior, which strengthens authority and student-teacher relationships, and promotes positive thinking. The students in Classroom 1 are more likely to feel hopeless about fixing the problem, whereas students in Classroom 2 are more likely to feel empowered. Imagine another scenario, this time with only one student engaging in rule-breaking behavior. Joe pushes his chair out, making it hard for you to walk up and down the aisle. It’s the second or third time he has done it. Teacher 1: “Joe! Can you move your chair back? You keep doing that and it’s in the way." Teacher 2: Walks over to Joe, continues teaching (this strategy is known as Proximity). If he does not move his chair in response to the Teacher’s proximity, Teacher 2 makes eye contact with Joe and motions for him to move his chair. Teacher continues to teach throughout. Joe moves his chair. Most teachers instinctively go straight for the individual, audible correction, “Joe! Can you move your chair back?” But less-invasive strategies like Teacher 2 used are just as effective in changing behavior. In addition, they’re less disruptive to the lesson, don’t reward Joe’s negative behavior with attention, and don't publicly shame him — resulting in a positive impact on the teacher-student relationship. See definitions for the above techniques in this Selected Teacher Workshop Handout. If you are in NYC, join a free teacher workshops with Liz — see upcoming events. Maintain a calm, neutral tone throughout. Remember, this is not personal. Calm is power. When a large percentage of students are breaking the rules, aim for a non-invasive strategy like modeling, whole group reminders, or reinforcing. When a small percentage of students are breaking rules, more direct corrections are needed. But use the least invasive strategy possible, like proximity, anonymous correction, or silent signals. If you have exhausted less-invasive strategies or the situation is preventing others from learning (and certainly if someone is physically or emotionally hurt, or threatening to be), it’s time to have a private conversation and employ necessary consequences. Although our instinct might be to go straight for a public, individual correction, it’s rarely necessary since there are less-invasive strategies that are far more effective — both short- and long-term. This approach also gives you options to escalate when you do need to use more direct intervention. Finally, when in doubt — take a deep breath. You don’t have to do anything in the next 10 seconds. Pause, breathe, and think — then make the best choice for you and your students. Former teacher, instructional coach, and recruiter with 10+ years experience in low-income NYC schools. Leads workshops and coaches to help teachers develop professionally.